Are you experiencing water leakage in your cold cellar (also known as a cantina or cold storage room) when it rains, when snow melts or you wash down your front porch? Have you noticed water running down the walls from the seam where your cold cellar foundation walls and concrete porch cap meet? 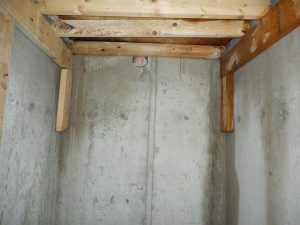 Do you still have wood forms on the ceiling that have mold or other signs of water leaking into your basement cold room? Not to worry, we can help! PCS Basement Waterproofing Specialists has become the leader in stopping and preventing cold cellar leaks. Over the years we have noticed this has become a common problem especially in newer homes. In many cases it is simply faulty construction and improper workmanship by the builder. However other causes include interlocking brick, flagstone or patterned concrete being installed over original concrete porch/steps, tiled porches, resurfaced porches and improper slope of front porch entrance area. Why Does My Cold Cellar Leak ? More often than not the main reason for cold cellars leaking is because of the landscaping material that has been installed or applied to the original poured concrete porch above. 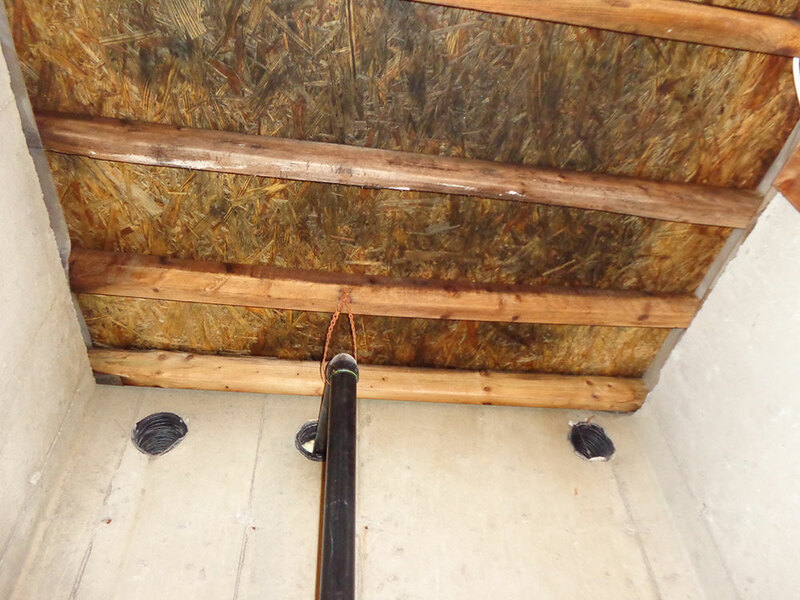 When we gather information from a homeowner who calls about water leaks in the cold cellar, one of the first questions we ask is whether or not anything has been done to the porch above. When a homeowner has interlocking bricks, patterned concrete, flagstone, tiling, etc., installed on top of the original concrete porch (cap), it causes rain water and other precipitation to remain trapped below the surface with minimal, if any, way for air or sunlight to dry it out. 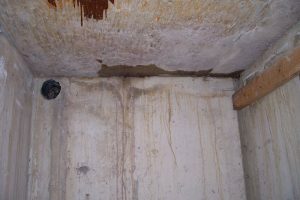 constant moisture begins to work its way through the seam creating a pathway to inside the cold cellar where is soon begins to leak and become visible. The seam is where any point of the front porch cap meets the foundation wall or any part of the home itself. Some homes may have one side of the porch cap that meets with the foundation or home, which means the problem would be with the seam running below where there front door threshold is situated. The problem would run from one corner to the other, leaving three other sides open to possible gardens on either side or the garage on one side and a garden on the other and of course the third always open side, the steps up to the porch. Other homes may have two sides or “L-shaped” style construction of the front porch or three sides for a “U-shaped” style that would be a problem. Another way water can enter is through the form joints where the front steps leading up to the front porch have been poured separately from the porch itself and begin leaking into the basement cold cellar. This can cause a significant amount of water to enter this area and accumulate or pool on the concrete floor until it becomes a concern to the homeowner and the finished areas outside the room. 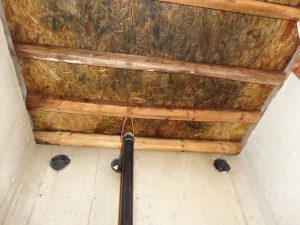 And last but not least, shoddy construction and workmanship by the homes builder can also be a big reason why you are experiencing water problems in your cold room storage area. 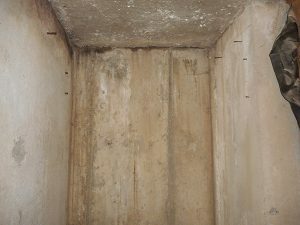 Your cold cellar is a breeding ground for mold because of the environment within and the organic materials such as cardboard boxes, carpet, fabrics, wood products and drywall or paper products that many homeowners often store in them. 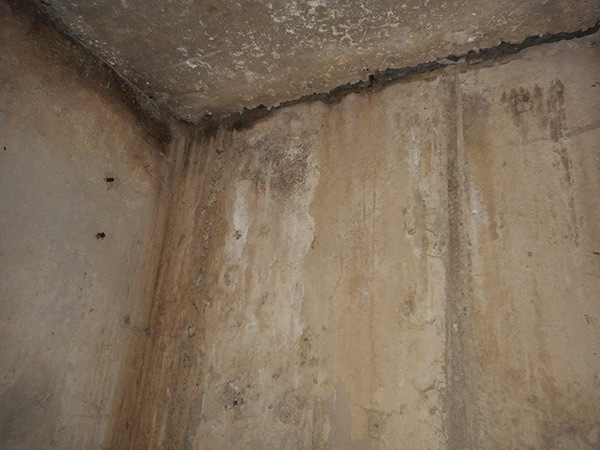 With minimal airflow and the humidity or condensation that is created from the constant hot and cold battle throughout any given year, it’s only a matter of time before mold will develop. One of the best ways to avoid getting mold in your cold cellar is to make sure the wood forms in the ceiling have been removed. Once a builder has poured the front porch and the concrete has had some time to cure, the wood forms can and should be removed by the builder. Unfortunately in most homes these wood forms have not been removed and the homeowner is left deal with potential mold issues. PCS would be happy to discuss how we can help you solve your leaky cold cellar issues, with our specialized solutions to this problem. Chris came in on time, did the work well and it's been working great since.I got several quotes before going with PCS. way cheeper. the crack was fixed 2006 and i have no issues since. Being a business owner myself, I can say that Chris is honest and PROFESSIONAL. I recommend him to my clients, family and friends any time I get a chance !! I've used this company many times and I will use them again ! It is hard to find a company that gives you the honest truth and works with you. It is QUALITY work at a reasonable price. Thank You Chris !! PCS Waterproofing is the premier waterproofing company in the GTA and has helped hundreds of homeowners resolve their leaky basement issues.